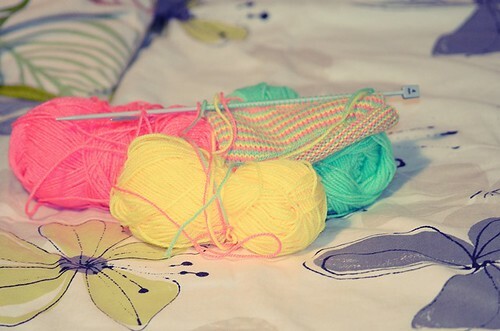 Colourful knitting, a photo by PhotoPuddle on Flickr. I have realised that most of the photos I take these days seem to be on my iPhone. This is obviously not a huge problem as the quality is actually rather good and you can also achieve some great effect. However, I think I need to stop neglecting my DSLR as it is rather fabulous. I want to get creative and get back to photographing everyday things from around the house. And by this I don't just mean my knitting as I realise I have been doing this a lot! As you can see I am still enjoying knitting multi-coloured stripes.